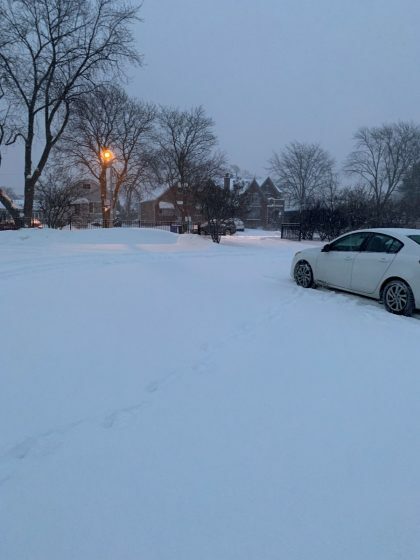 Parking lot at Dever Elementary at 7 a.m on Jan. 28, 2019. Well, that was a lie, as some of our staff and rank-and-file members will attest (below). Have your own story? 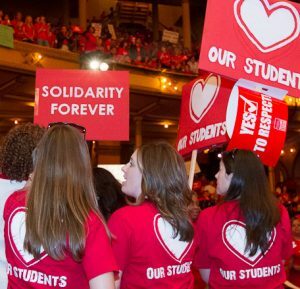 Let us know at communications@ctulocal1.org. The parking lot was not plowed by the time I arrived. The snow “crew” consists of ONE custodian! The sidewalks and stairs were not shoveled or cleared. How does CPS expect staff and students to arrive safely to their school buildings? My school had issues with some rooms being without heat. One major issue I found was that students who are bussed here waited over an hour at their neighborhood schools because bus companies did not have enough bus drivers today. One student walked into my class at almost 10:50 a.m. and had waited for 2.5 hours with her little brother until a bus finally showed up to pick them up. One parent emailed me and said they had to take their kids to work with them after waiting an hour for no bus to show up. Some kids informed that their neighborhood schools did not allow them to wait inside; therefore they waited outside in the snow and cold for a bus to show up. This was not communicated by CPS as they assured parents “everything” would “be prepared” for students to arrive to school safely. Sidewalks were not cleaned properly. I saw many kids slipping and falling or even walking in the streets. CPS does not make it an option for students to come to school as they never announce that absences will be excused on these days. High school students had finals and there were special schedules. Those students were forced to go to school. I saw one high school student whose car was stuck on Western (a large street) because it was not clean. My staff is concerned that neither of our lots (we have two) have been plowed. The snow blower broke a while ago. The engineer has requested a new one to no avail. She literally spent the day shoveling the walkways by herself today. Is there something that can be done to get a new snow blower??? My classroom and I believe all classrooms had heat. However, Sodexo did not come plow teacher parking lots (this morning) AGAIN. Out of the four times it should have been plowed, they came only once. It is very frustrating because as I drive to work I see another Network 13 school lot getting plowed. I just got a call from a teacher at McClellan, who reports that CPS failed to plow the parking lot that our members use. She got stuck trying to turn into the alleyway to get into the rear lot. McClellan has two lots, front and rear, and by end of today they’d plowed the front lot where the principal and assistant principal park, but had not plowed the back lot. Neither lot had been touched when she got to school today before 7 a.m. Last week, CPS plowed on Tuesday, but did not salt until Thursday. On Tuesday, January 22nd, I walked out one of our exits (Door 3) to dismiss my students. I took two steps and fell backwards on the ice. I felt a crunch in my neck. I tried to stop my students from walking on the ice. Simultaneously, a 6th grade class dismissed, and one of the students fell and hit his head on the ground. I asked a parent to get security and we were able to stop classes from using this particular exit. Manierre’s parking lot was not plowed today, making it hazardous to walk. I’m writing to report a weather-related issue at my school today. The street in front of the school wasn’t plowed, and neither the parking lot nor the sidewalk incline into the parking lot were plowed. Several teachers reported that their wheels were spinning as they were driving into the parking lot, and my own car got stuck in the snow as I tried to pull into to the parking lot. I couldn’t go forward or back, and I had to shovel the street around my car just so I could reverse and find parking elsewhere. Hello! Where does plowing the parking lot and property fall in weather-related issues? Many staff, including myself, had a great deal of difficulty getting in, out and simply walking through the lot today. There was an amount of not feeling safe on that part of property today for many of us. I know the engineer worked on the sidewalks and walkways, but the lot was left unplowed by CPS today. Students wore their jackets, gloves and hats inside at Healy school. Our parking lot is never cleaned until the night after if at all. Sidewalks were not cleared. Staff and admin had to run the snowblower and shovel. There is not point in contacting anyone about the failures because no one at CPS or the contractor does anything about it. Also not sure if anyone is clear on whether Aramark/Sodexo employees are supposed to do any snow removal. This is at Disney II, 3815 N Kedvale. I live on the South Side and work on the North Side. It took me over two hours to commute to school on unplowed or poorly plowed streets today. It was so dangerous commuting like that. The plows could not keep up with the snowfall. While passing McNair I witnessed many families walking in the street with young children to avoid icy and unshoveled sidewalks. One mom in particular had an infant in her left arm, a toddler on her right hip, and two kids under 7 walking along IN CICERO AVE to get to school. Other families en route to other schools were doing the same thing. You see a lot driving 110 blocks north to south each day. Peterson’s parking lot was not adequately plowed because only our engineer was at school today, leaving him too much work for one person to safely do. But he tried. Oh how he tried. He often gets into it with Aramark for doing too much, but he’s trying to keep us safe at Peterson. Today my son’s school was not cleaned. The sidewalks were filled with snow. I saw the janitors from my son’s school Octavio Paz Acero cleaning the sidewalk and entrance from the school. 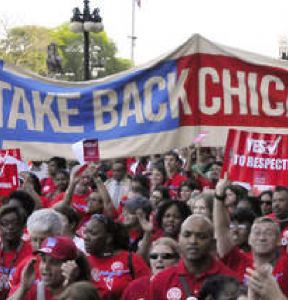 Rahm has to stop lying and get stuff done. He has to have the city employees ready for this kind of weather. We don’t pay high-dollar city taxes just for him to make downtown look pretty to attract tourists. We need that money to be invested in our schools. Our staff parking lot at Dever Elementary was not shoveled yesterday. I took a picture. This was at 7 a.m. and it wasn’t shoveled all day. Yesterday CPS officials blatantly lied to the public. I work at a South Side elementary school and there were no shoveled paths and the parking lot was so full of snow that cars were getting stuck at the entrance. To make matters worse, many parents were walking in the middle of the street with small children. One of our classrooms had no heat but this morning, the heat is working. I guess that is a plus. The state should force the school district to close on inclement weather days. I am a pre-school teacher in the Englewood area and I observed students walking to school with no hats, gloves or boots on. Many of our little children had on gym shoes which meant that their feet, socks and shoes were wet. Unfortunately, many parents do not have weather-related essentials for themselves or their children and will send them out with what they have. It is for this reason that CPS needs to do better when extreme cold weather hits our city. On Monday January 28, 2019, teachers and students were put at risk here at Burnham. The roads and sidewalks around the school were not plowed or shoveled. The teacher parking lot was not plowed and several teachers almost stalled out trying to enter the lot. The sidewalks got done at 1:30 p.m. and the streets were still not done when we left for the day. Our custodians were unable to make it in the morning, so one of the men who works for the lunch staff was kind enough to shovel the stairs and the ramp for the teachers. The custodians were unable to make it last night, but some did come in this morning to take care of the school. As of 8:45 a.m. there were only half the staff at the school. The rest of the staff was calling and texting to notify us that they were stuck in snow or traffic. Luckily, most staff made it to the school by 10. I personally felt extremely unsafe and my car fishtailed while trying to leave for the day. I was lucky there were no cars behind me and was able to get the car under control. At Stowe this morning, none of the parking lots were plowed. They were completely snow-covered and anyone (myself included) who tried to park in there was sliding around, spinning their tires, then had to trudge through the snow to the building. The one down the street was apparently worse. When I asked our engineer what happened, he said that he received word (not sure if it was a call or email) that the company that plows our lots would not be coming until 6pm tonight. The building itself was fine, if a bit over-heated. It was kind of an insult to me that those of us who fought our way in with the dangerous roads didn’t even have a clear safe place to park. Our engineer did his best and around noon used his smaller snowblower to make a path into the lot but it was still slick and difficult to navigate when we left at the end of the day. I am emailing regarding weather-related problems at Burke Elementary today, Tuesday, January 29. I am a 2nd grade teacher. My nails have been purple/blue since this morning. My students have not complained but they are used to the temperature control (or lack thereof) in our classroom. There is at least one first grade classroom who has been wearing their coats in their classroom since entry. I am sure there are other complaints but these are the ones I am aware of. The building/classrooms are typically either too hot (you have to crack open a window) or too cold, like today. I know it could be worse and the buildings are old; on a day like today, however, I really wish it were too hot in here right now. Thank you. I am writing in regards to the article in which Rahm stated that schools were cleaned and safe on Monday, January 28th. I can speak about Carl Von Linne and assure you that nothing was plowed nor salted. Sidewalks surrounding the school were covered in snow and extremely slippery. The parking lots were ice rinks covered in snow; cars were sliding and getting stuck. Also, the building wasn’t well heated. Several faculty members slipped and had difficulty getting into the building. There’s no accountability for custodians nor engineers. At Stowe this morning, none of the parking lots were plowed. They were completely snow-covered and anyone (myself included) who tried to park in there was sliding around, spinning their tires, then had to trudge through the snow to the building. The one down the street was apparently worse. When I asked our engineer what happened, he said that he received word (not sure if it was a call or email) that the company that plows our lots would not be coming until 6 p.m. tonight. The building itself was fine, if a bit over-heated. It was kind of an insult to me that those of us who fought our way in with the dangerous roads didn’t even have a clear safe place to park. Our engineer did his best and around noon used his smaller snowblower to make a path into the lot but it was still slick and difficult to navigate when we left at the end of the day. As we return to work today, we are sitting in our classrooms with jackets on, space heaters and heating blankets. How are these acceptable working conditions? Yes, we understand they are aware of the issue but that doesn’t make it any better. I broke my ankle slipping on ice under the snow. Now have a six week recovery. At Perkins Bass, there are several classrooms that are cold, to the point where some teachers, including myself, have had to move classrooms since last Thursday because our classrooms are too cold to have students in them. However, even the classroom that I had to move my students to was still cold and had cracked windows, but it was not as cold as the classroom we are normally in. My classroom is the coldest room in our building. The engineer put a garbage bag over the window and there is an air bubble that has been created as a result of the draft coming from outside. Even though my classroom is the coldest, all of the classrooms on one side of the building are cold. We were told that this is a result of us receiving the winds from the open field/park across the street. However, the park is not moving so what will be done? As mentioned above there are several classroom with broken windows that have cracks in them that are contributing to the temperatures that we are experiencing. Ultimately it is sad that our students have to experience this at school. We should not have to move ourselves and drag learning materials across the building everyday in order for students to be in a warm(er) learning environment. Locke Elementary’s parking lot was never plowed this week, or if it was plowed they plowed over already packed down snow because the parking lot is just a sheet of packed snow. Also, I share an office with another teacher in a storage closet turned office, so there is no capacity for heat in there.